Ruth had just woken up from her nap and was sitting alone near her mat with her head lowered, arms crossed, and a sad expression on her face. Three-year-old Lizzie walked over after noticing her friend was not moving to participate in the classroom activities. Squatting down and looking closely at Ruth’s face, Lizzie gently patted Ruth on the back and gave her a soft toy. Lizzie’s acknowledgment of Ruth’s feelings caused other members of the class to ask Lizzie what was wrong with Ruth. Following Lizzie’s lead, other children brought toys over to try to cheer Ruth up. It worked, soon Ruth was sitting with the group. She had a big smile on her face and a lap full of toys. Caring for others involves the ability to recognize and respond to the feelings of another person. It requires a certain level of empathy. Empathy grows out of an understanding of how another person is feeling. During the month of June, the children at Stepping Stone School will explore what it means to care for others as we focus on the trait of caring as a part of our Communities of Character™ curriculum. Use “I” statements. Children will follow your example. By describing how you feel, you invite your child to explore how she is feeling. Statements like, “I feel so excited, I get to spend time with you today!” allows your child to recognize causes for certain feelings. Read stories about feelings. Books like My Many Colored Days by Dr. Seuss and Feelings by Aliki allow children to explore different feelings. They provide vocabulary and reasons why someone may feel a certain way. It provides a safe context to share and discuss different feelings. 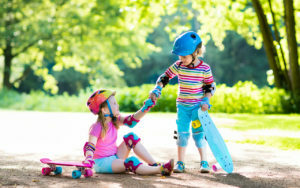 Even very young children can begin recognizing feelings and how their actions influence the way another person feels. By labeling those feelings from an early age, children become more aware of the attitudes of others. Recognizing feelings builds empathy and empathy builds a desire to demonstrate caring behaviors and actions towards others.